I’ve always said that I just want the truth. I want to know how it really is. Is there a personal God? Is there just a deity? Or is religion just a superstition? What does God want? Does He/She communicate one on one? Or is the source of communication somewhat of an impostor? A chameleon? The truth. My questions have changed. I realize that truth changes and there is truly no one absolute truth. My premise was incorrect or incomplete. I wanted THE TRUTH. I thought at one time that there could only be one. Like the rock of Gibraltar in one place that didn’t move and didn’t seemingly erode. The truth is, there is no one site for truth. Truth has changed as I have changed. Look at your own truth. When we are young, truth is simple. Good, bad, happy or sad. Imagine if you kept those simple ideals as your truth. Good guys wear white and are nice. They open doors and smile. As life changes, you realize that good guys wear all different colors. White horses and white hats are for the movies we watched in those days. In the 1980’s and 1990’s, the good guys blew up buildings and fought in wars. In those movies they wore black and green. Truth is not a simple statement. It’s a concept. It’s like home. Where is home? Home can be people, family, friends, a library, a coffee shop, a house, your grandparents or your car. Home resonates inside of us. We know it when it’s there. It’s different for everyone. Which leaves me with my questions on truth. I may not ever know the facts about the history of God or our origins. I have to accept my limitations. My knowledge base doesn’t exist beyond this world and the answers aren’t here. There’s no ancient discovery that accounts line by line the unveiling of God or humanity. Or the role of religion in this world. No, there are many ancient discoveries. There are many voices that speak compellingly their truth. The loudest ones are not always the right ones. Even with the wisdom of Solomon we couldn’t untangle the knots of fact and fiction. I can’t do a search on Google or Bing to get the answers. They don’t have all the answers. 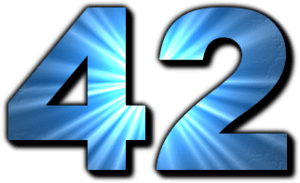 According to the book and movie, The Hitchhiker’s Guide to the Galaxy, by Douglas Adams, the answer to the greatest question “What is the meaning of life?” is 42. Of course it’s a joke, from a funny movie, but sometimes everything seems like a joke from a funny movie. You just have to laugh.